Just as one good rule of business is finding the right location, location, location, a cardinal rule of any successful organization, association or nation is leadership, leadership, leadership! The business rule has to do with finding the best geographical position for doing the best business. The organizational rule has to do finding the leader possessing the right mental and spiritual disposition to create stability, dexterity, prosperity and continuity for the organization. Most good leaders understand that to be successful means adopting some time honored principles which strengthen the leader and solidify the main frames or infrastructure of the organization. One basic rule of good leaders is to possess a vision for where you want the organization to go. The leader should know where he or she is going. If you don’t have a vision, that is to say, a mental or figurative understanding of what you want to achieve and where you want to go, you can end up in a bad place. A humorous anecdote from my personal life might illustrate this point. As a member of the Boy Scouts, I always looked forward to our annual summer camping trips. One night as we lay in deep sleep in our tents, we were aroused from our snooze by one of the troop comedians who decided to undertake a mission to find the real Bloody Bones. We had all heard the dark tales of Bloody Bones and his merciless attacks on various troops which camped out in the area. Our fearless leader decided that we would brave the dark without our flash lights and pocket knives and that if we met Bloody Bones and routed him, we might earn a special merit badge for bravery, but something told me otherwise. As we crept quietly into the dark, our fearless leader waved us onward into the crispy night air. We trudged and trudged and trudged through the bushy grass and cloistered thickets of trees. “Yes! I do know where he is. Just shut up and march on,” said our confident, experienced leader. Well after twenty more minutes of marching, three of the troop members suddenly let out a loud yell, as they fell one by one into a small dung heap whose wooden out house frame had been set back from its usual place. Needless to say rather than find Bloody Bones, the three troop members- I had fallen to the back of the line of twelve- were in a “bloody,” stinking mess, which was a shot heard round the scouting world. The problem is the leader did not have a vision of where he wanted to go and how he wanted to get there. He had an idea of who he was going to get but did not master the details of the journey or possess the proper equipment that would help us get to our destination. The axiom is true, and I don’t mean to sound crass in paraphrasing this thought; where there is no leadership you can end up in deep do-do. Another basic rule of good leadership is to listen to those you lead. Good leaders are also good followers. Again, the lesson of this experience is pertinent. Although our fearless leader told us not to bring flashlights, some of us brought them anyway. I had my flashlight and so did three others but were scolded by our leader that we had to face the dark without lights. Had we used our flashlights, as I had periodically flashed mine to see where we were going, they could have avoided falling into the excrement. Our fearless leader ignored our pleadings to use light so we could see where we were going. Yes, we had night vision-that is to say, our eyes adjusted to the darkness- but there was no moon to guide us. We were just walking and wallowing in the dark at the woofing of our beloved fearless, comedian leader who knew the way. Good leaders listen to those they lead. Needless to say, our journey did not end in comedy although we laugh like all get out today about the experience. A final basic rule of good leadership is to value good preparation. There is no substitute for good preparation for it is always more demanding than the presentation, so to speak. It’s not just leading but preparing as much as humanly possible to lead which makes the big difference. Surely there are lessons we learn along the way. We learn by doing. The point is that prepared leaders are the point. If you don’t know, be willing to learn and ask someone who knows. Preparation also means studying and remembering what you’ve studied. Be teachable. Be prepared. Immerse yourself in the experiences of others from whom you can learn. Be willing to go all out with preparation for the job you have been called to do. It all boils down to leadership, leadership, leadership. With it we have a chance for success. Without it we can end up in deep mess which we can ill afford at this critical time in our nation’s history. Despite our failed search for Bloody Bones, some of the greatest leadership lessons I have learned in my lifetime were received from the Cub Scouts and Boy Scouts of America. I am forever indebted to my scout masters, mentors and senior troop leaders and others for the ways in which they instilled in us excellence in scouting; urging us onward to more merit badges, to strive for Eagle Scout and cherished induction into Order of the Arrow. 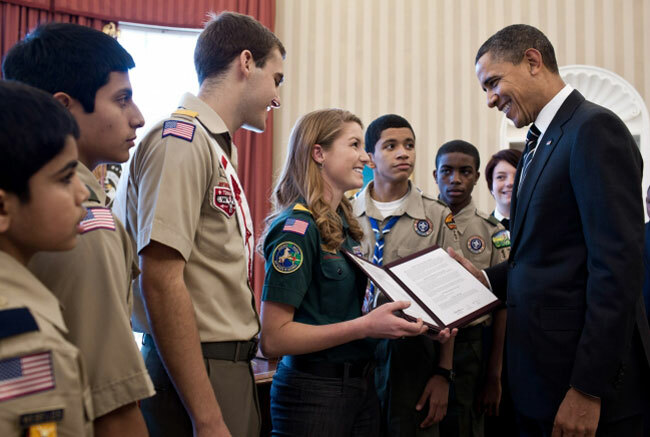 “Onward and Upward,” are familiar statements made to us as scouts to encourage achievement. The Boy Scout motto “Be Prepared,” has been a life long value for me in every field of leadership and enterprise of knowledge, learning and growth that I have undertaken in my youth and adult life, which has prepared me for leadership challenges today and those which will certainly come tomorrow. Leadership, Leadership, Leadership is needed today and will certainly be needed tomorrow as we tread dark paths to a brighter and more glorious future for America and the world. The world still summons America and its leadership to promote the highest standards of excellence in democracy for all peoples and nations. The world is a better place for that leadership. We need it now more than ever.